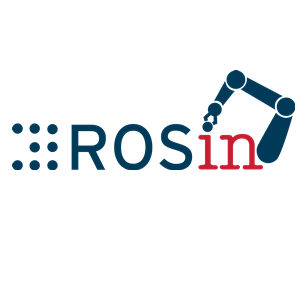 ROSIN aims to create a collection of open-source, quality-assured software components for real-world robot applications1. Its starting points are the existing ROS-Industrial framework and community. One of the instruments used by ROSIN to progress towards the stated goal consists in the concept of Focused Technical Projects (FTPs). FTPs are efforts driven by clearly defined, narrowly focused objectives. Such instrument aims to complement the work on the basic ROS infrastructure with development targeting concrete business needs. FTPs targeting these needs can require for instance software development, the definition of technical standards, or security and license audits. These are some of the activities needed to obtain software components with the envisioned levels of technical quality and commercial applicability. process-related work, e.g. code security audits. improvement of documentation: technical manuals, deployment guides, etc. the open-source community. This ensures continuous development of the common infrastructure, possibly creating a virtuous cycle of further interest and investment. A good example of an application developed as an FTP in the past is, for instance, Robotic Blending3, developed as an FTP over 4 milestones with partners in North America and Europe, and providing automated removal of surface defects through 3D sensing and mesh processing. This FTP can be considered an example of application and algorithmic development, and publicly available source code for it is online4. One or more organizations, the FTP participants, can apply for funding directed towards a Focused Technical Project by submitting a proposal describing their goal, the technical plan to achieve it, and an estimate of the involved cost. The financial support provided by ROSIN for an FTP will amount up to 33% of the total cost of the FTP and a maximum amount of EUR 100.000, with the involved organizations committing to finance the remaining share. If a third party participates in multiple FTP projects, then the total sum of all ROSIN FTPs may not exceed EUR 250.000, for each third party for the duration of the ROSIN FTP programme. Submitted FTP proposals will be continuously evaluated in a process governed by the ROSIN board. FTP participants who submitted proposals selected for funding will enter legal negotiation phase, in which they will be required to sign with the ROSIN coordinator the necessary legal agreements. After a successful legal negotiation phase, selected FTPs will start. For each project, the ROSIN board will appoint two members of the staff from the ROSIN consortium members for its monitoring and counselling to the FTP participants. The submission of an FTP proposal will consist of a single step process to submit the FTP application to the Online Submission System at http://rosin-project.eu/ftps managed by ROSIN. One or more entities (the FTP ‘participants’) based in a country eligible for H2020 funding, realize that they need a certain new feature, component, or demonstration. They will only focus on real needs, because as a group of users, they will commit to funding the total development cost of the entire FTP. ROSIN seeks market pull rather than technology push for innovations. It is financially interesting for the participants to do this, because they fund part, but benefit from the whole, possibly keeping the rest of the community at a distance by delaying open-source publication usually by 6–12 months and maximally 24 months. FTP proposals will be submitted by a single entity or a consortium of “applicants”, one of them being the lead (the FTP proposal “champion”). The champion is the main driving force behind the FTP project, bearing at least 60% of the costs not subsidized by ROSIN. The development work will be done by the organization(s) deemed to be the best candidate(s) and identified as such in the FTP application. Please note that the organizations doing development work and those not performing it are in both cases part of the FTP application (i.e., they are all applicants for that FTP), but for the sake of clarity we further label those actively performing development work as the ‘performers’. In principle, any legal entity that is entitled to participate as a partner in Horizon 2020 Research Programmes may participate in an FTP application. Member States: Austria, Belgium, Bulgaria, Croatia, Cyprus, Czech Republic, Denmark, Estonia, Finland, France, Germany, Greece, Hungary, Ireland, Italy, Latvia, Lithuania, Luxembourg, Malta, Netherlands, Poland, Portugal, Romania, Slovakia, Slovenia, Spain, Sweden, United Kingdom. Associated Countries (as of 13 April 2016): Albania, Bosnia and Herzegovina, Croatia, Faroe Islands, FYR Macedonia, Iceland, Israel, Moldova, Montenegro, Norway, Serbia, Switzerland, Ukraine, Tunisia and Turkey. An FTP application has three mandatory parts: Part A, Part B, Part C and Part D.
Part A contains the administrative information about the FTP project and the applicant organizations. The information in Part A is entered through a set of online forms in the Online Submission System which is described in Section 3 of this Guide. Parts B and C of the FTP application are based on a "template" (see “Annex 1: FTP Application” of this Guide). The applicant should follow this structure when preparing the application. The template is designed to highlight those aspects that will be assessed against the evaluation criteria. It covers the characteristics of the technical project, its potential impact and the roadmap for its execution. Part B is a PDF document that contains a description of the stated goal of the project. Part C is a PDF document, containing the work plan on how to achieve the FTP goal, including a clear definition of milestones, together with an estimate of the costs and distribution of budget. Part D consists of a PDF scanned copy of a signed document stating that all participants commit to provide funding for the milestones subsequent to milestone one (1) and for the remainder of the project. Optionally, the application may include also a PDF file with a slide presentation of the project and a video showing additional supporting information about the project. These additional materials can be uploaded through the Online Submission System. Proposals must be submitted electronically, using the Online Submission System at http://rosin-project.eu/ftps. Proposals arriving by any other means are regarded as “not submitted”, and their respective senders shall not expect any notification. The call for submissions will be continuously open from March 31 and until August 31, 2020, or the date on which the share ROSIN budget dedicated to FTPs will have been fully allocated, whichever comes first. Proposals can be submitted any time during this period. However, four cut-off dates per year are planned for FTPs evaluation. All the proposals submitted before the first cut-off date will be evaluated and the evaluation results communicated to the applicants. The applicants of approved FTP applications will be immediately contacted to negotiate and sign the FTP contract with ROSIN. The applicants of rejected FTP applications will be able to re-submit an improved version. We expect to select 4-5 applications in each cut-off date. However, based on the expert evaluation of FTP applications, the ROSIN Board reserves the right to select more or less FTP proposals, and to hold some of them upon request of further information from the applications. 1) Call opens: March 31, 2017. This process will be repeated approximately every 3 months. If an application is successfully submitted, the system will automatically send an acknowledgement of receipt. This acknowledgement of receipt does not imply that the application has been accepted and declared eligible for funding. The FTP Panel will first check the eligibility criteria for the proposal, discarding those that do not meet them and producing a review report justifying it and, when possible adding feedback to solve the issue and potentially perform a re-submission. Two members of the FTP panel are assigned to the proposal for its evaluation by the ROSIN Board, avoiding conflicts of interest (e.g., if a robot manufacturer submits a proposal, ABB will not be involved in the review). Each reviewer evaluates the FTP according to the evaluation criteria, and if the reviews are heavily disagreeing, a third reviewer can be assigned to the proposal. FTP proposals with marks over a certain threshold are deemed technically sound and passed on to the ROSIN board for further evaluation. The ROSIN Board, will decide by unanimity whether the FTP is selected for funding, based on the evaluations performed by the FTP Panel. Members of the ROSIN Board that declare a conflict of interest will be excluded for this vote. The Expert and Ethics Board will review the selection of FTPs to be funded, and will report any ethical or conflicting issues to the ROSIN Board. Concretely one person from the ethics committee and another one from the technical oversee committee verify that 1) the FTP does not violate ethics concerns and 2) is in the spirit of the ROSIN goals. If both experts give their approval, the FTP proposal is selected for funding passed to the contract agreement phase with the ROSIN Board, otherwise it is rejected. General questions can be sent to info@rosin-project.eu, and a response can be expected within a few business days. Note that this e-mail service is for general questions only, and not for individual feedback on project ideas and FTP proposal drafts. Champion – participant organisation leading an FTP proposal, and committed to bear 60% of the cost not funded by ROSIN. Ethics Committee – committee of experts in Ethics in the Robotics domain appointed by the ROSIN Board, who will evaluate the FTP applications according to the H2020 rules on Ethics. Focused Technical Project (FTP) – An FTP proposal is a small project between 60k-300k, 1-2 years, to be funded and executed by a group of collaborating companies/institutes to design, develop, extend or standardize ROS-Industrial related technology. FTP Panel – evaluators for FTP proposals, formed by experts appointed by the ROSIN Board. For each new FTP proposal, the ROSIN Project Coordinator and the RIC-EU coordinator independently evaluate the likelihood of conflict of interest between each of the evaluators (members of the Execution Board), and members deemed to have a conflict of interest (which could be the ROSIN Project Coordinator as well) are excluded from evaluation of that particular FTP proposal. The second step is that all evaluators for each proposal have to sign a declaration stating that they have no conflict of interest. Online Submission System – refers to the electronic submission system accessible from http://rosin-project.eu/ftps for sending an FTP proposal to apply for ROSIN funding. Performer – organisation participating in an FTP proposal that will perform the development work. Technical Oversee committee – committee of international experts in robotics and robot software appointed by the ROSIN Board, independent from the ROSIN consortium members. A maximum length is specified for the different parts of the FTP application. The applicant must keep your application within these limits. The evaluators will not take into account any part of the applications that exceeds the established limits. However, independently of the limitations, the applicant should bear in mind that it is in her interest to keep the application concise and right to the point. The maximum lengths established should NOT be interpreted as the desirable length. Overlong proposals are rarely viewed in a positive light by the evaluating experts. For example, Part B - Project description can perfectly have a total length of 3 pages. Take into account that the application does not require that you include all technicalities about the technology.